Ike and Tina Turner were married in Tijuana, Mexico in 1962. Tina met Ike when she was still a teenage in 1959 when she sang during one of his shows in St. Louis, Missouri. 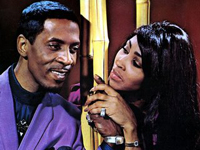 The tempestuous, abusive marriage of Ike and Tina Turner is well-known not only for the physical abuse Tina Turner experienced, but also for the serial infidelity of her drug-addicted husband, Ike Turner. Izear Luster Turner Jr. aka Ike Turner was born on November 5, 1931 in Clarksdale, Mississippi. Anna Mae Bullock aka Tina Turner was born on November 26, 1938 in Nut Bush, Tennessee. Ike and Tina had one child together, Ronald “Ronnie” Renelle Turner who was born in 1960. The violent marriage of Ike and Tina came to an end when Tina left Ike in July 1976. Their divorce became final on March 29, 1978. Ike Turner died on December 12, 2007 in San Marcos, California in his sleep at his home. He was 76 years old. A report from the San Diego County Medical Examiner’s office stated that Ike died from a cocaine overdose. A memorial service was held on December 21, 2007 at the Greater Bethany Community Church City of Refuge in Gardena, California. Tina Turner has lived in Zurich, Switzerland since 1994. - Ike Turner Jr born in 1958. Son of Lorraine Taylor and Ike Turner. - Michael Turner born in 1959. Son of Lorraine Taylor and Ike Turner. - Raymond Craig Turner born in 1958. Son of Tina Turner and Raymond Hill. - Ronald “Ronnie” Renelle Turner born in 1960. Son of Tina and Ike Turner. - Mia Turner: Daughter of Margaret Ann Thomas and Ike Turner.